2. Combine the flour with the baking powder, sugar and salt in the bowl of a mixer fitted with a paddle attachment. 3. Add the shortening and mix on medium speed until a mealy consistency is reached. Mixing on low, gradually add the buttermilk, until just combined. Add the scallions and mix just enough to incorporate. 4. Empty the dough onto a lightly floured work surface and knead into a rectangular shape. Roll the dough, with a floured rolling pin, to about a ½ thick rectangle. 5. Cut out the rounds using a 2 ½ round biscuit cutter. 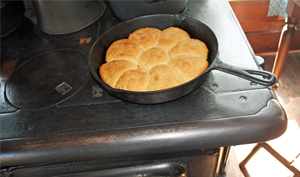 Drop the biscuits in the bottom of a well-seasoned, lightly oiled 10 Lodge cast-iron skillet. 6. Brush the tops with the egg wash and bake for 20 to 25 minutes, until the tops are browned and the insides are firm. Serve warm.